US firm Boeing has announced plans to open its first European commercial factory in South Yorkshire, creating at least 30 jobs. If approved, the £20m plant will be built next to an existing research centre founded in 2001 by Boeing and the University of Sheffield. The company said the factory, at Catcliffe in Rotherham, could also lead to new jobs in the supply industry. The plant will manufacture hi-tech aircraft components. President of Boeing Europe, Sir Michael Arthur, said they chose South Yorkshire for the factory because of a skilled workforce in the area and the firm's links with Sheffield's Advanced Manufacturing Research Centre (AMRC). He said: "The area has very high skills, particular in advanced manufacturing technology, which we think is world class." "We, as a company, want to start making these very sophisticated components - actuation systems, the gearing systems on wings, and Sheffield is a good place to come," he added. 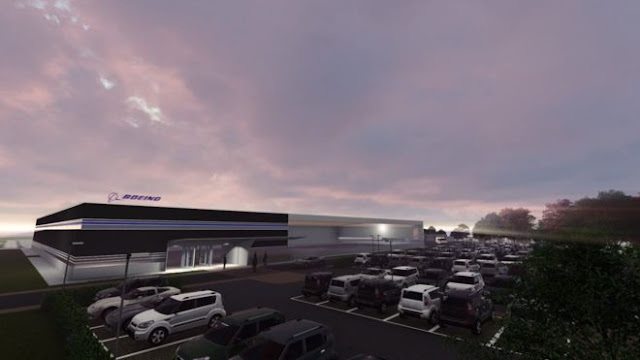 The factory, which will produce actuators for 737, 737 MAX and 777 aircraft, will be next to the AMRC centre. Boeing said it would also increase its commitment to research at the site. If planning permission is granted, the site could up and running by late-2018. The news comes shortly after luxury supercar manufacturer McLaren announced it is planning to build a £50m chassis factory on the site, creating 200 jobs. Professor Keith Ridgway, of the AMRC, said the investment takes the region on from its coal and steel heritage to manufacturing high performance components for the automotive and aerospace sector. Rolls Royce already has a jet engine factory on the site.